In this blog for our Evidence for Everyday Health Choices series, Sarah Chapman looks at the Cochrane evidence for aspects of routine dental care. Something to smile about? Or are there big gaps…? 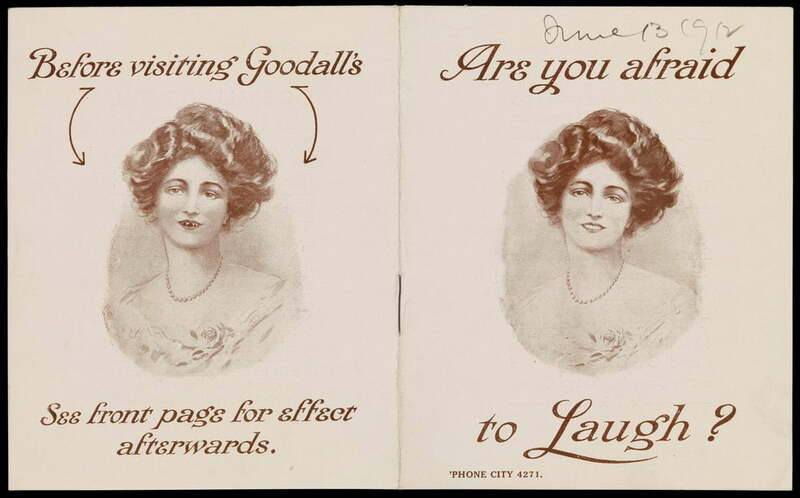 “Are you afraid to laugh?” Goodall’s Dental Institute, 1912. My grandmother used to tell the tale of when she was a schoolgirl, back in about 1920, and a school event to which parents were invited. Nan and her friend enjoyed a carefree afternoon without their mothers there, having avoided inviting them – the friend because her mother had white hair, and Nan because her mother had just had all her teeth taken out. There was trouble, she recalled, when they were rumbled by a write-up of the event. Teenagers haven’t changed much in the hundred years since then, but thankfully the state of the nation’s teeth has. My great-grandmother would not have been unusual in having all her teeth removed, to be replaced by an easier-to-care-for set of dentures, and some women even received this as a 21st birthday present! This changed, thanks, in part, to free dental treatment through the NHS from its beginning in 1948, the fluoridation of toothpaste from 1959, improvements in diet and a new emphasis on good dental hygiene. Today, we are commonly told we should have a dental check-up every six months, and a visit to the dental surgery often includes getting advice from a hygienist on how to care for our teeth and gums, and perhaps a ‘scale and polish’. This routine dental care is all so familiar we may not question it, but we should! What’s the evidence? Does it give us, and our dental health professionals, something to smile about? How often should you have a dental check-up? As a child, I loved my regular visits to the dentist. As an infant, I delighted in the toy farm in the waiting room with, joy of joys, a ‘real’ well with a bucket you could wind up; while my teenage dental trips were always followed by a visit to the ice cream parlour (oh dear…)! But is there any evidence behind the common recommendation that we should go every six months? No there isn’t! The Cochrane Review addressing this found just one study with 185 people; insufficient evidence to support or refute that six-monthly recall. This is something that has been debated since the 1970s and we still lack evidence to guide practice! That’s disappointing. So what about that ‘scale and polish’? Is the evidence any better? 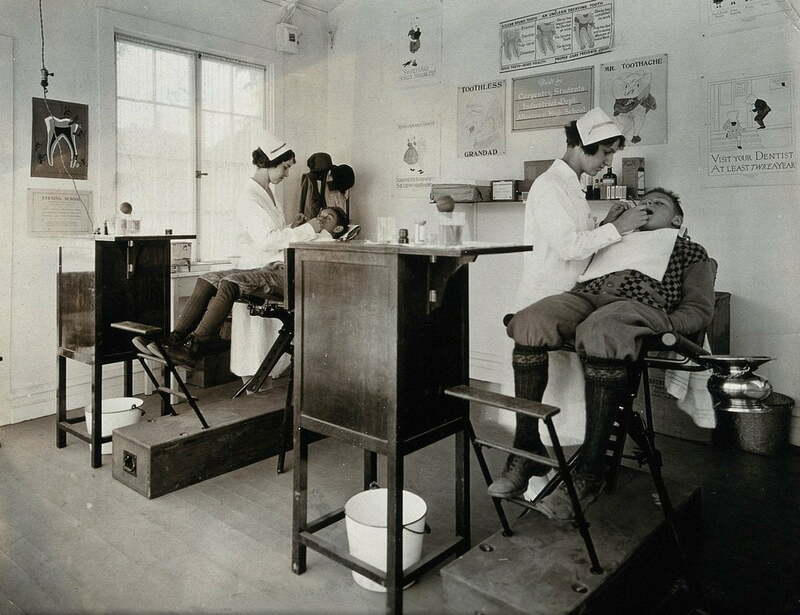 US dental clinic, circa 1920. Wellcome Collection. 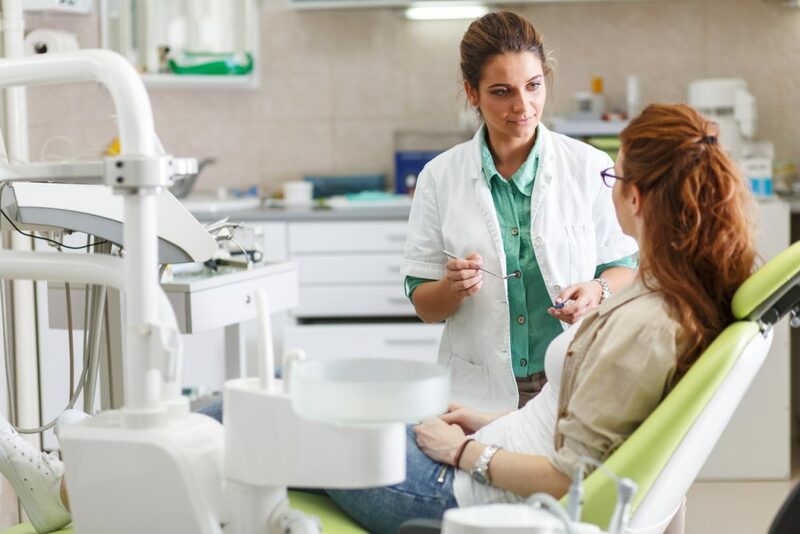 Both hygienists and dentists provide scaling and polishing for their patients at regular intervals, even when those patients are at low risk of gum disease. There is uncertainty about whether this is useful and how often it should be done. Along with a sit-down and a chance to reflect on your guilt about not having flossed when you were told to, the ‘routine scale and polish’ offers you the removal of deposits of bacteria called plaque, and hardened plaque known as tartar or calculus, which is too hard for removal by toothbrushing by even the most diligent brushers (I’m looking at my husband, bafflingly motivated by the promise of a digital smiley face after two minutes, on a gadget linked to his toothbrush. He is 55…). A Cochrane Review on routine scale and polish has just been updated and at last we have some robust evidence to inform practice. There is now high-certainty evidence that for healthy adults without severe gum disease, who regularly access routine dental care, routine scale and polish treatment makes little or no difference to early signs of gum disease over two to three years follow‐up, compared with having no scheduled scale and polish treatments. There is a small reduction in calculus (tartar) but its importance is uncertain, and there may be little or no difference in plaque levels. People having six- or twelve-monthly scale and polish reported feeling their teeth were cleaner than those who didn’t have it, but there did not seem to be a difference between groups in oral health-related quality of life. The studies didn’t look at adverse effects. I have yet to meet a dental hygienist who didn’t advocate flossing, but I really can’t be bothered to do it, and I don’t want to find a reason to add yet another source of plastic to my environmental footprint. Need I feel guilty? There’s a Cochrane Review on flossing too, which includes 12 studies with 582 people, comparing flossing and toothbrushing with toothbrushing alone. All the studies looked at the effects on gum disease and plaque. Once again, there was so much variation between the studies that the data couldn’t be pooled. Whilst there is some evidence that flossing added to toothbrushing may reduce gum disease and plaque compared to just toothbrushing, it is unreliable. For adults, feel free to choose whether or not to floss your teeth, but it’s probably wise to steer clear of this year’s dance trend, or you risk being ridiculed for your flossing, like Jeremy Corbyn at the Pride of Britain Awards. 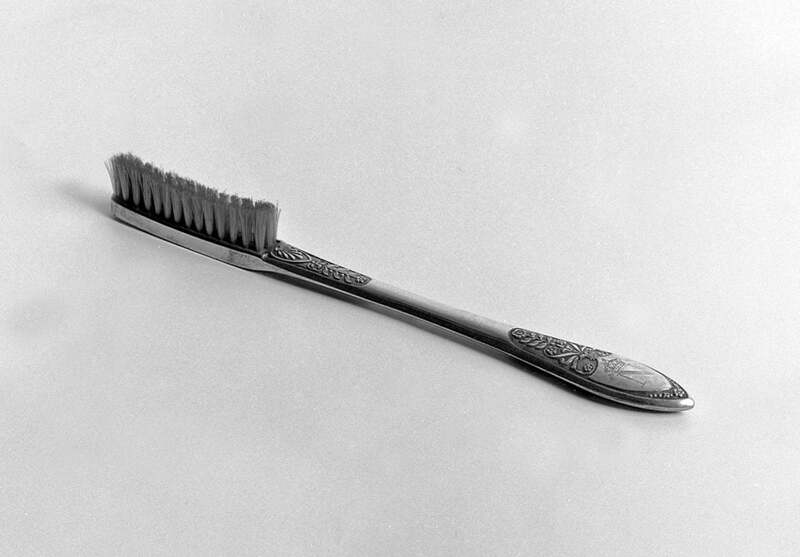 Napoleon Bonaparte’s fancy toothbrush (Wellcome Collection). Would he have been better off with a powered one? Another Cochrane Review has evidence you might want to consider when choosing your toothpaste. It finds that fluoride toothpaste containing triclosan and copolymer leads to a small reduction in tooth decay and is probably more effective at reducing plaque and gingivitis than fluoride toothpaste without those ingredients. As for chlorhexidine mouthwash, you can read all about the Cochrane evidence in this blog by dentist Bosun Hong. 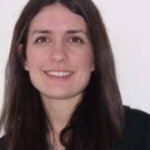 Join in the conversation on Twitter with @SarahChapman30 @CochraneUK @CochraneOHG or leave a comment on the blog. Page last updated 16 January 2019. It’s really interesting to see this – thank you for sharing it. I’ve now referred to the IQUaD trial in the main text of the blog – thank you. It would be great to have a blog from you, if you’re interested? Thank you Sarah! I would be keen to contribute of course, but I am not sure how to do it? I too enjoyed reading this and am very glad I did not live 100 years ago! Would be great to see more studies which would help us to determine if the investment is worth it. Referring to personal financial investment: in the UK you have the NHS so a dental visit or cleaning costs very little compared to what we have to pay in other countries.